Bringing our innocent unconsciousness, our Dreams, to the forefront! Broadening our horizons! Born of an independent spirit and a passion for freedom, Le Vignoble du Rêveur is a new chapter in the story of my maternal grandfather’s vineyards. Vignoble du Rêveur includes no grape purchases, no negociant activity, and remains entirely my own production. All his life, my grandfather fought for his independence, the true definition of liberty! Working his vines today is my way of paying homage to his fight and idealistic dreams; I intend to continue his battle. It’s time to take back the right to dream, to construct a future without limits, to reinvent wine and its definition, to break the rules and move walls! It’s time to open our eyes wide and see that anything is possible! Nature is the ultimate guide when it comes my viticultural practices. I immediately began reconverting the vineyards back to organic and biodynamic agriculture with each new parcel. After all, this was the only vititcultural mode throughout most of history! Because I have taken back my family’s holdings little by little, some of the wines are already certified organic while others are still officially in conversion. The Dreamer is only half-asleep, the dream is only just beginning; there are so many things still to try, to rediscover. One project for the coming years: find a fine-tuned process for skin maceration for our white wines, “Singulier” is just a first draft! The ideal being to eliminate the use sulfur for these naturally-structured wines. Our parcels are located mostly in the commune of Bennwihr, just outside of Kaysersberg valley. 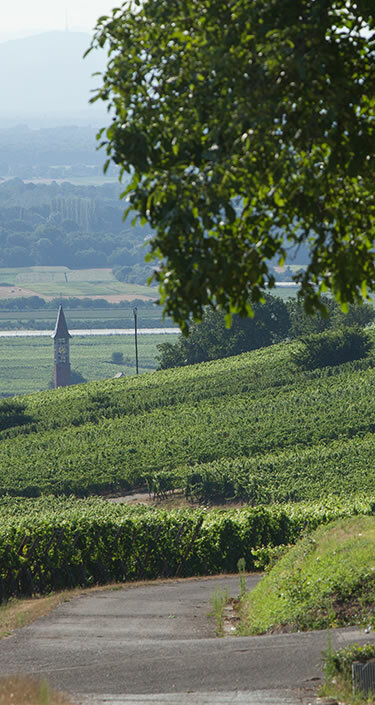 The soils have Quartenary rocks, a terroir that produces aromatic wines with freshness and youthful energy. Three cuvées, three original personalities, one goal: stay creative. This cuvée has quite unusual aromas of apricots and white flowers. Full-bodied on the palate with a slightly tannic finish, it is dry Alsatian wine. The acidity is softened, without aggressiveness, making for a well-balanced ensemble. Carbonic maceration of Riesling and Pinot grapes for 10 days. Next, alcoholic fermentation in large oak barrels, without any sugar additions, acidification, or commercial yeast. The wine ages for one year on fine lees before being bottled with a very low level of sulfites. A energy that hums on the palate, a breath of fresh air! Bright, with a beautiful lemony acidity. The palate is taut, precise, and vibrating with youthfulness. Alcoholic fermentation in large oak barrels, without any sugar additions, acidification, or commercial yeast. The wine ages for one year on fine lees before being bottled with a very low level of sulfites. The palate is supple though precise, making you want to pour another glass. In bringing life back to the vineyards that my grandfather and maternal uncle worked their entire lives, we perpetuate their story. This is my personal responsibility, but it’s more than that: it’s a desire to perpetuate and safeguard their revolutionary spirit into the future. Don’t hesitate to contact us, we’ll get back to you as soon as possible.